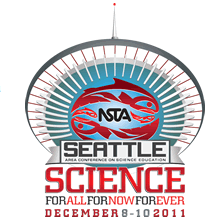 The 2011 NSTA conference in Seattle was packed with great sessions, exhibits, field trips and more. I spent most of my time at featured panels & presentations (the ballroom type events) and plan to recap some of my favorite sessions in upcoming blog posts. I attempted to Tweet quotes, main points, and thoughts during the sessions. You can see the Tweets HERE and a few examples below. You may also want to check out #NSTA11 to see what other science educators were Tweeting from the conference. This entry was posted in K-12 General Science, Science teacher Professional Development, Washington State Science. Bookmark the permalink.